ST. JOHN'S, NEWFOUNDLAND AND LABRADOR--(Marketwire - Sept. 14, 2010) - At their annual meeting today Canada's Ministers of Health discussed a range of issues important to strengthening the health of Canadians. Ministers endorsed* a Declaration on Prevention and Promotion that will guide their efforts to promote healthy living across Canada. In response to Canada's high rates of childhood obesity, Ministers also released Curbing Childhood Obesity: A Federal-Provincial-Territorial Framework for Action to Promote Healthy Weights. As a first step they will engage citizens, government and non-government partners, and industry to develop a shared approach to turn the tide on childhood obesity. This will include discussions on different ways to increase the availability and accessibility of nutritious foods, and decrease the marketing of foods and beverages high in fat, sugar and/or sodium to children. "I am extremely pleased that we reached agreement to focus more of our attention on helping Canadians, especially children, lead healthier lives," said the Honourable Leona Aglukkaq, Minister of Health. "Childhood obesity is a national public health challenge that requires all sectors to get involved." "By working together we can change the social, economic and physical environments that influence the health of children and families," said the Honourable Jerome Kennedy, Minister of Health and Community Services, Newfoundland and Labrador. "We must focus on early education and support for healthy eating, physical activity and positive self-esteem in order to address the true cause of obesity." Ministers reviewed the latest scientific knowledge related to ongoing research in the area of Multiple Sclerosis treatment. Recognizing how difficult and frustrating living with MS is for thousands of Canadians, Ministers re-affirmed their collective support for advancing the scientific research necessary to determine the safety and effectiveness of the MS liberation procedure. Ministers agreed on a way forward. There are studies underway where preliminary results are expected to be available in a matter of months. Ministers supported Canadian research efforts that have been launched to date to determine if there is a link between CCSVI and MS and will work together to responsibly accelerate this scientific research. Coordinated clinical trials of the CCSVI treatment will happen in Canada if and when the scientific evidence supports it. Ministers' resolve to work together is strong. They are committed to doing everything they can to accelerate progress in this area. Ministers acknowledged the role of governments in working with all stakeholders to help create the conditions that make the healthy choice the easier choice. Sodium reduction is an important part of healthy living and Ministers are encouraging Canadians to reduce their consumption to close to 1500 mg per day, the recommended daily intake for Canadians aged 9 to 50 years of age, and less for those younger and older. Ministers adopted the interim goal of reducing the sodium intake of Canadians to a population average of 2,300 mg per day by 2016. This represents a reduction by one-third from present levels of 3,400 mg per day. In support of this effort, Health Ministers call on industry leaders to fast-track voluntary sodium reduction in food products, and to work with governments to increase education and awareness of consumers, industry, health professionals and other key stakeholders. Ministers support the immediate implementation of voluntary targets including a monitoring mechanism and engaging in exploratory discussions on the role that regulatory instruments could play and under what conditions they could be used. Ministers also received a status update on Canada's isotope supply situation and will continue to study the impact of the past year's supply disruptions. 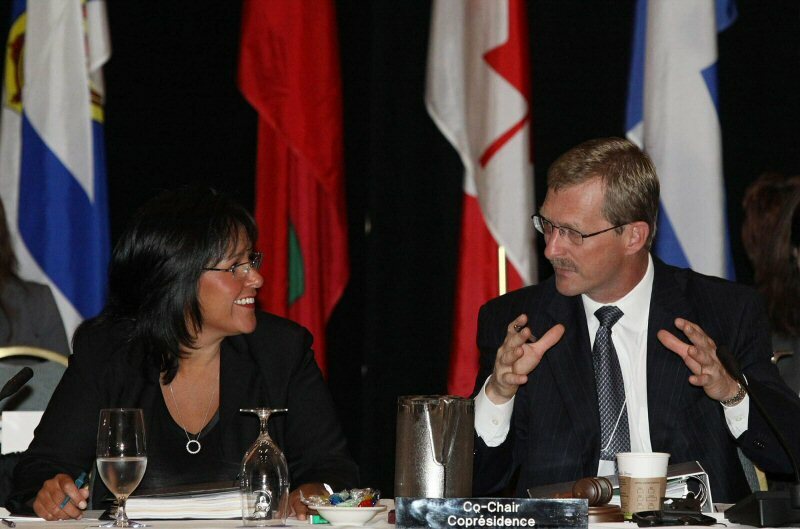 Minister Aglukkaq acknowledged a request from the P/T Ministers to strengthen the security of Canada's isotope supply. * It should be noted that although Quebec shares the general goals of the Declaration and Framework for Action, it was not involved in developing them and does not subscribe to a Canada-wide strategy in this area. Quebec intends to remain solely responsible for developing and implementing programs for promoting healthy living within its territory. However, Quebec does intend to continue exchanging information and expertise with other governments in Canada.